As of May 2013, Kindle Fire nips at the heels of Apple's iPad to be the second-best-selling tablet, with about 7M units sold according to estimates by Forrester Research. Needless to say, its impressive-looking tablet screen doomed to watch videos and play games has greatly lured the eyes of tablet followers and video enthusiasts. But the unexceptionable video watching experience on the pocket-size tablet should not be subjected to format limitation. To help you to play video on Amazon Kindle Fire beyond the bond of the restriction of video formats like MTS, AVCHD, MKV, MOV, FLV, AVI, etc, this article will guide you to convert video to Kindle Fire viewable format in a couple of clicks. To achieve this goal, you need the help of Kindle Fire video converter software. 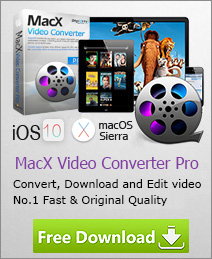 Among them, MacX Video Converter Pro comes to be in the spotlight for its all-inclusive video processing features, not only letting you convert video to Kindle Fire including the 8.9-inch and 7-inch Kindle Fire HD, but also enabling you to transfer video to iPad, iPhone, Google Nexus 7, Samsung Galaxy S9 edge/Note 8, HTC One, Surface, WP8, etc at a surprisingly fast speed. Particularly, concerns about the format issue for Kindle Fire are unnecessary absolutely. This Kindle Fire video converter handles pretty much videos you throw at it, no matter SD videos such as MP4, FLV, MOV, AVI or HD videos like MTS, M2TS, AVCHD, MKV and more, making all videos playable on Amazon Kindle Fire (HD) with 100% quality reserved. Tips: to get video converted for Amazon Kindle Fire, you need to first download this Mobile Video Converter on your macOS. 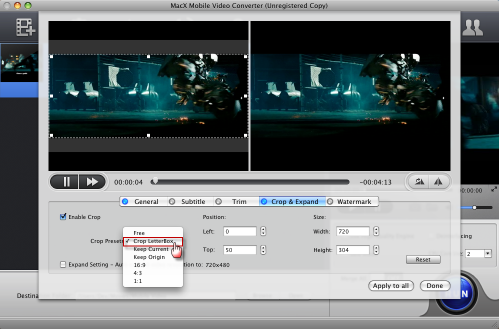 Launch this Mac program, import source video by clicking "+" button at the top left corner. Additionally, you can load multiple files at a time. After loading the source video, the output profiles windows will pop up automatically to assist you to choose suitable profiles for your device. You can easily find the optimized presets for Kindle Fire, Kindle Fire HD under Android Pad Video > to Android Video. If you want to watch the video on your Kindle Fire without black bar, the amazing video editing feature will let you crop the unwanted part. You can even add watermark to make your video personalized. Click "Browse" button in output setting area and select a destination folder to save your output video. 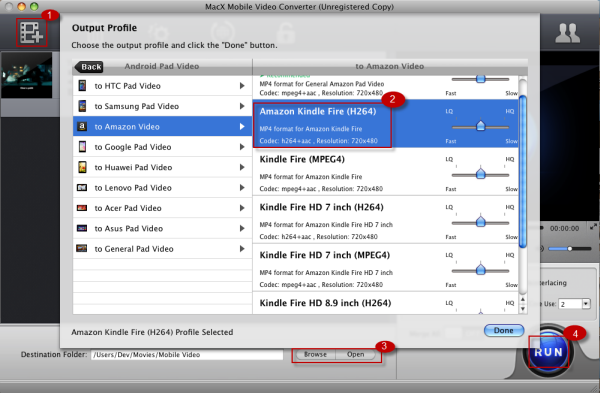 Click "RUN" button to trigger the video to Kindle Fire HD conversion on Mac. That's all. Once the conversion is done, mount your Kindle Fire (HD) on to your computer via USB to copy converted file into your tablet. Another striking point of this Amazon Kindle Fire video converter rests on its adjustable parameter settings, letting you tweak the video codec, video bitrate, frame rate, aspect ratio, resolution, audio codec, audio channel, audio sample rate, bitrate etc as you want, to get the optimal video image on your Kindle Fire. Additionally, you can make ringtone for your mobile phone by converting video to audio MP3, WMA, AC3, AAC, DTS, FLAC, ALAC, etc on macOS with this app.